Avid guitar collector and average guitar player Claes is writing about his thoughts on buying and collecting guitars, fixing them up yourself and just general guitar stuff. Claes has never even met a real luthier and doesn’t pretend to be an expert in any way. He just believes that the best way of learning is by trying and he likes to share his experiences and mistakes as he goes along and learn more and more about guitars. Claes loves all guitars as long as they are older than 30 years and ideally were made in Sweden or Japan. His first attempts to change anything on a guitar was when he decided that his Morgan Telecaster needed a wee bit of bling and it eventually became, the Claescaster. Please give credit to my site and authorship. You may contact me at my site. Thanks. I came upon your site while trying to find some information on my ZEN-ON SW 500 Western Deluxe Guitar. I believe it is an attempt to produce a Martin D-35. The strange thing about it is brass nut and saddle and string pins. It plays incredibly well, but I can’t really date it (my guess is 1976), made in Japan. I have a serial number but I can’t seem to find a place to input it. 23038 5M 500. Unfortunately I don’t have any more information about this brand, I have actually never heard of it before. I’m sorry. I think it’s going to be too expensive to send it to the US. It’s normally 80-100 euros just inside the EU so with the taxes and all it’s going to be a too much. I have a Goya GG 163 ser# 2434 Goya Music, New York, NY. 10010 Made in Sweden. I was hoping that you would know what year this guitar was made. Any help would be appreciated. Thanks And by the way great website and beautiful guitars. I have a Morris Custom W610 guitar that I bought in 1981. I wonder if you tell me something about it. I regularly search the Internet for information and your site has the most information that I’ve found. I’ve seen the Worthpoint auction site but there is no history there. Thanks for the reply, Claes! I was wondering if you knew the history of the Morris W610 – There has never been a sticker or serial number in the guitar (that I can see) and I’ve read that other W610’s were built in 1973 by S. Yairi. From your posts, you appear to be a Morris guitar fan and I thought that you might know more of the history of this guitar. There can’t be too many of them out there. I’m a producer in Amsterdam and my Director is looking for you! He knows you from a previous casting and would like to work with you. Are you still working as an actor? I can fine very little information regarding this guitar and who made it. I haven’t heard of the brand before but since most of the mid 1970’s Japanese guitars are identical, just different logos, I think you are right. Probably built by Matsumoku then. I can see photos on your website of your LS-55 and your neck pickup. 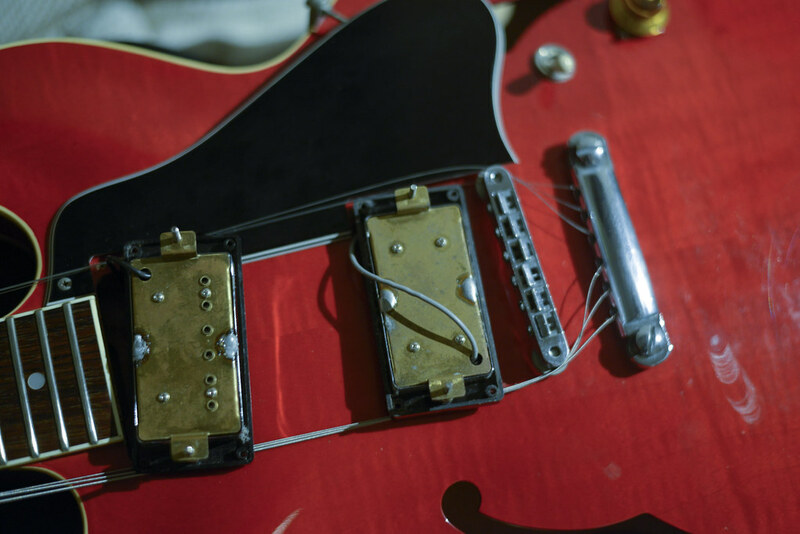 This looks very similar to the neck pickup in my ES. I am interested, do you remember if your bridge pickup looks the same as mine, and have you found out any info on the pickups? Hi Jimmy. To be honest, I don’t really have any info on the pickups. I just know that they sound damn good, better than any Greco LP I’ve tried. Vet du något om Terada TR1006? Vilken fabrik, har själv ingen aning. Hej. Terada byggdes i Teradafabriken, precis som tidiga Morrisgitarrer. Terada är en fantastisk fabrik, de bygger Gretsch och Orville numera. 1975 kan nog stämma, de flesta tillverkare slutade använda höjbara stall runt den tiden så senare är den inte men kanske tidigare, typ 1972-73. Troligtvis så är den hellamminerad. I recently bought a Morris WJ21-n from 1982. It looks and sounds beautifull, but I have not been able to find any information about it anywhere on the internet. I don’t really have more info to give than what you can find in my blog posts about the Morris guitars I used to own. I have a Levin Goliath serial # 109498. I have had it for 52 years. I love it to bits. But one of the gears on the machine head winder is worn and slips so I can’t tune the 3rd string. (Open tuning is all I can manage which is OK but a bit limiting!!). I don’t want to replace the machine heads with something new and shiny. Do you have any idea where I can find some original replacements? Depends on what machine heads you have on, does it have Van Ghent tuners? Normally you can find original parts on eBay but they are quite pricey. I just acquired a 1966 Goya T-16, in good shape and sounds great. The neck needs to be reset and I having trouble locating a tool that fits the recessed square bolts (Robertson screws?). Do you have any advice on this? Thanks for your help and very nice site! I think a Phillips #2 screwdriver will fit. Try to find one that sits really well in there so you don’t damage the square bolts. I have a beautiful Rider custom R400D made by Hayashi Musical Instruments in Matsumoko Japan and can find no info about it. Can you help? I don’t have any more info to give about that specific brand, I’m sorry. congrats on your blog! I really dig the guitars you show – especially the old Levins! I have a beautiful 1967 Levin LN 26 in good shape and very well set up but with the notorious adjustable plastic bridge saddles. It’s a cool instrument, it has a lot of mojo and the neck is perfect – but still I think the sound could be richer. Especially a bit of bass is missing. You have played so many old Levins. Do you think the adjustable plastic bridge saddles have a strong influence on the sound? I can imagine but never have played a vintage Levin Goliath with a bone bridge. Have you ever replaced the plastic bridge saddles by a classical bone bridge? I’m not a big fan of the plastic saddle screws, as you said, they lack both bass and clarity. I changed the whole bridge on my 1968 Levin LT-18 for an ebony bridge with a real bone saddle and that did a world of difference, you can hear the video comparison here.